What are the big lessons you learned by tracking all of these newsletters and their recommendations over the years? The biggest one is that people don’t always tell the truth. We already know that, but the corollary of that insight is that people’s well-honed instincts, which detect outrageous advertising in almost every other aspect of life, somehow get suspended when it comes to money. If a used car sales-man came up to somebody and said, “Here’s a car that’s only been driven to church on Sundays by a grandmother,” you’d laugh. The functional equivalent of that is being told that all the time in the investment arena, and people’s reaction is, “Where do I sign up?” The prospect of making money is so alluring that investors are willing to suspend all their rational faculties. It is important to have a fine filter for what advice you are willing to listen to. Hulbert’s recommendation is to “run, not walk” from those who engage in outrageous advertising. It is never safe to take their claims at face value. If it seems too good to be true, it may simply be fraudulent. Why risk working with someone who bends the truth? On our website we strive very hard to be accurate and clear in our advice. We also try to be empathetic about prioritizing the financial advice which is important and timely over the advice which is interesting but not urgent. Most websites are not as diligent about trying to present the nuances of financial planning. We recommend that you limit your consumption of financial news to calm and trusted sources like Marotta On Money. Avoid every site which is less than truthful. Avoid sites which are filled with advertising or promote deals to save you money. And avoid sites that include any doomsday predictions. Even if you are appropriately skeptical of these types of articles reading them will anchor your thoughts on the wrong questions and mislead your thinking. You only have so much will power to tune out the noise, remain calm and remain disciplined about rebalancing your portfolio. At a minimum don’t be naive about how frequently financial claims are simply not true. 2. The best newsletters do not continue having superior performance. 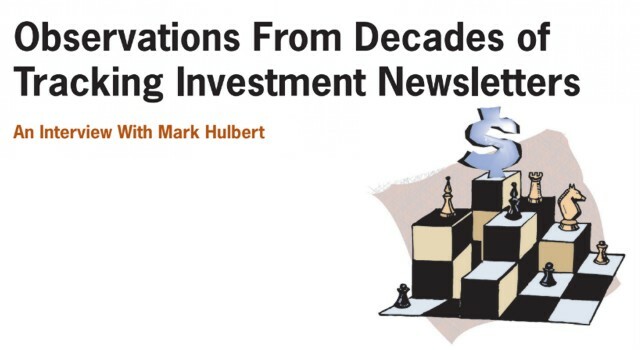 Another interesting result of Hulbert’s analysis is to find that the best performing newsletters do not continue having superior performance. He divided the advice offered by newsletters into the four separate quartiles by the three-year return offered by taking their advice. Then he looked at how the newsletters in each quartile did for the next 3-year period. Among newsletters in the top quartile you would expect that simply by random chance 25% of them would be in the top quartile during the subsequent 3-year period. If the advice from the newsletters had persistence, you would expect that percentage to be higher than 25%. In fact only 15% of the newsletters in the top quartile for the first three years were in the top quartile for the next three years. Conversely 33% of the newsletters in the bottom quartile rose to be in top quartile for the next 3-year period. 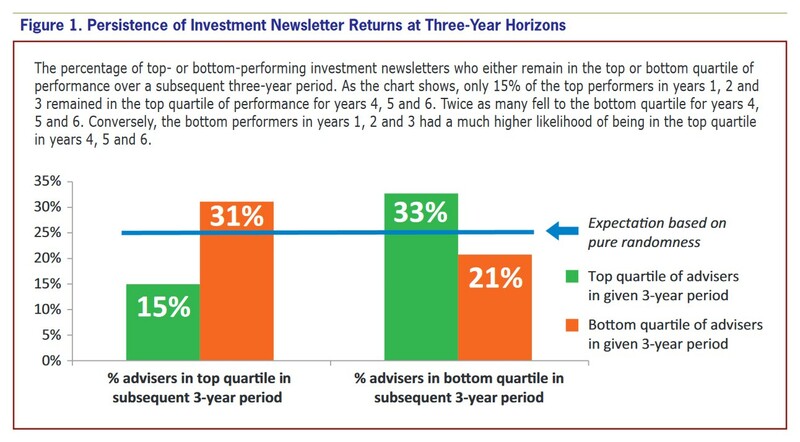 And 31% of the top performing newsletters dropped to the bottom quartile. Here is a chart from the original article. One of the really telling factoids that I like to talk about with clients is the famous study by business school professors Brad Barber and Terrance Odean, where they looked at more than 66,000 individual accounts at a discount brokerage firm. Every time a stock was sold, they looked to see if another stock was bought within 30 days. So, they made the assumption that the one that was being bought was a replacement for the one being sold. Why would you have sold one and bought the other if you didn’t think the one you bought was going to do better? It turned out that on average, even before transaction costs, over the next year the stocks that were bought returned more than 3% less than the stocks that were sold. The investors would have done a lot better if they hadn’t sold, just stuck to whatever they were holding. Why would we systematically always be buying what we should be selling and selling what we should be buying? The answer is our emotions. So really, it’s a combination of randomness or luck on the one hand and our emotions, our self-destructive emotions, on the other. And boy, you put those two together, and it’s a miracle anyone ever beats the market over the long term. Many studies have found similar results. Chasing returns, on average, costs investors a significant loss of return. This is because switching any strategy risks switching when it is recently out of favor but about to come back into favor. In investing a decade is not long enough to judge returns. Even very long periods of time may not be sufficient to experience the superior returns of a brilliant investment philosophy. In past decades, expensive subscriptions to printed investment newsletters were much more popular than they appear to be today. Nowadays they have been replaced by even less reliable email subscriptions that would do not even justify being printed on paper. Meanwhile all the time and effort spent reading and following such advice may be doing your portfolio more harm than good. If you turn off all the overly hyped financial news, you may increase your returns significantly. At a minimum you might save an hour a day which would result in 45 additional 8 hour days to be more productive and more relaxed. If you appreciate our calm, rational approach to investing and financial planning free of hype and advertising you can subscribe here. Images are screenshots from the article.